In thinking about the wine and spirits industry, however, we tend to focus on those first two book-end components: your production and the customer experience. 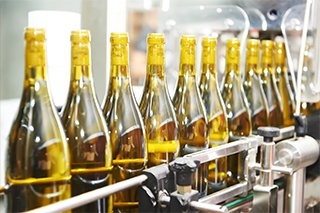 However, a great deal of important work occurs in between – the logistics of bottling, packaging, storing, transporting, and delivering the products. Due to tremendous advances in these areas being made daily, it may be time to consider your existing logistic strategies and the ways in which they can be optimized. Below are 10 ideas to help a company streamline its wine logistics operation. There are several benefits to storing wine and spirits in a TTB-bonded warehouse, especially when considering the safety, space, storage conditions, and security that these facilities provide. These facilities also have the ability to save you money since excise taxes are not incurred while the products are stored in bond. Taxes are only paid when the products are shipped from the storage facility, allowing you to schedule and manage cash flow accordingly. We all have a love/hate relationship with glass. It’s pretty and does a nice job of “containing.” But glass is also fragile and heavy, which adds to your shipping costs. By shipping your liquids in large bulk containers and performing the bottling closer to the destination, you can drastically reduce shipment costs, improve shelf life, and eliminate loss due to glass damage in transit. Most importantly, technology and protocol improvements have helped to ensure that the quality and integrity of your product will not be compromised during shipment. In fact, research on bulk importing of wine by the Waste Resources Action Programme, shows that temperature stability is “improved by bulk shipment – since a larger single volume of liquid has a greater thermal inertia than a smaller one.” You can further reduce costs and improve cycle time by shipping your bulk liquids to a third-party logistics (3PL) provider who can provide integrated supply chain services – bottling, packaging, storage, and delivery functions – under one roof. When compiling holiday gift packs, twin packs, and variety packs of wine and spirits products, many manufacturers will ship items out of storage to a co-packer, who then creates the gift packs and then ships back to the storage facility or directly to retail. You can remove at least one costly step of this process by partnering with a 3PL that has experience providing logistics services for beverages. Very likely they can produce gift packs on-site from existing inventory – without products ever leaving the warehouse. By implementing this secondary packaging strategy, you can reduce combined wine and spirits distribution, packaging, and transportation costs by 30% and improve cycle time by at least 7 days. Over-the-road transportation can cost about $5,000 per trailer cross-country. As each rail car holds about three trailers’ worth of goods, you can lower transportation costs and carbon emissions by incorporating rail transportation as part of an overall intermodal strategy. In its Green Freight Handbook, the Environmental Defense Fund estimates you can reduce fuel costs 15%–20% by switching from truck to rail. Importantly, every component of rail shipping has been streamlined in recent years to be more efficient than ever. Gone are the days of multiple contracts with multiple railyards and multiple vendors; all transportation details, from door-to-door, can now be addressed by one contract and coordinated by a 3PL provider. Get ‘em in and get ‘em out! Cross docking is the process of sending an incoming shipment of goods from a truck, trailer, or rail car out for distribution immediately. That is, the goods arrive on the dock and go right out for distribution – eliminating the need for storage in between. This may not seem like a big opportunity for savings at first, but let’s consider the fact that storing a single pallet requires labor to put it away and to pick it and ship it. How does this extra handling impact your bottom line? Let’s say Company A needs to store 150,000 cases and can fit 60 cases on a single pallet, resulting in the need for 2,500 pallets. It takes 8 minutes to handle each pallet in total, resulting in 20,000 minutes, or 333.33 hours. Using a labor cost of $25/hour, it costs Company A approximately $8,333 in labor to store these pallets. When considering this scenario repeated continuously throughout the year, the potential savings with cross docking begins to look quite impressive. If you have a lot of inventory at your plant, you then have a lot of inventory far away from your customers. Consider partnering with a logistics company with the capacity to handle all that you can give it. An effective 3PL provider can both receive and distribute your stock seamlessly, ensuring that there are no bottlenecks in the outbound supply chain, no demurrage charges or wasted transit costs, and no disruptions during low- or high-demand periods. Having one storage facility for your entire inventory may not be ideal. Regional distribution centers have the ability to reduce costs by reducing the distance shipments must travel to the final wholesaler. While additional facilities do come with additional space and inventory costs, transportation costs are the largest drain on your bottom line. In terms of demand, regional distribution centers allow you to fulfill orders and efficiently meet the demands of your wholesale customers. Finally, there’s the security aspect that no one likes to consider: regional distribution allows you to spread the risk of damage to your inventory across multiple locations in the event of a disaster or other major disruption. Collaboration in logistics is rare among wine and spirits competitors. For that reason, you might find two half-filled trucks from the same region pulled up, side-by-side, at the exact same wholesale distribution center. How crazy is that? It’s like taking a cab to the airport and running into your neighbor, who booked and paid for his own cab. For maximum freight efficiency, it helps to think “We,” not “Me.” Consolidating loads with nearby competitors could cut your LTL costs as much as 25%. As an example, Kane Is Able works with a mid-sized consumer packaged goods (CPG) manufacturer who was spending $632,000 annually on LTL shipments. After introducing consolidation into the equation, we reduced the cost for the same volume of freight to $467,680 – a savings of $164,320. It may be time for wine and spirits manufacturers to innovate in this area as well. Now, for the red tape…government agencies of seventeen U.S. states and jurisdictions control the sale of spirits and, in some cases, wine at the wholesale and/or retail level. Ensuring that your inventory is stocked in these states – and stocked in the appropriate amounts in accordance with bailment laws – can be a daunting task (to put it mildly). By partnering with a 3PL provider who has expertise and appropriate licensing at each state and local level, you can ensure that your inventory is stocked appropriately and is agile enough to meet changing demand in those states. In short, you can keep your focus on production and trust your inventory to an expert partner who can manage the details for each locale. In recent years, the wine and spirits industry has seen innovations in technology, sustainability, and efficiency. But there are still challenges to be solved: fuel is expensive, regulations are different from territory to territory, and glass can still break. Yes, we’re back to our love/hate relationship with glass. It may seem silly to fixate on such a seemingly un-improvable staple of the industry, but why can’t glass be improved? Look at the cost of broken glass on the warehouse side alone: it costs about $4 per case just to deal with a broken product. For very large distribution operations, it’s not unusual for 10,000 incoming cases each month to be damaged in some way. That’s an unnecessary $40,000 expense per month just to deal with damages. It is a very expensive problem that someone will likely solve (or at least greatly improve) someday. Let’s invent the unbreakable bottle! Whether these ideas are new to you or not, it’s important to understand that each one of these tactics is much easier to implement than it was even five years ago as logistics experts and 3PL providers continue to optimize every single facet of your supply chain. A slight tweak here or there can end up saving you thousands of dollars and many days of improved cycle time. So, consider your current wine and spirits distribution and see if there is any streamlining that you can do.